We had two inspections this week of brand new homes, and both houses had serious problems with their ductwork. The first picture shows a duct full of water. This will cause a host of problems. 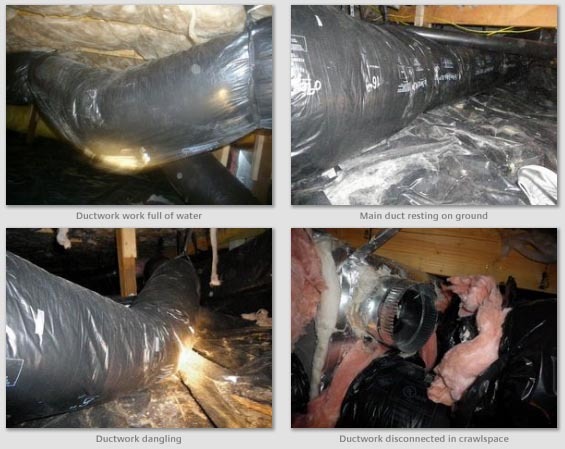 Any flexible ductwork that has had water inside or soaked insulation wrap must be replaced. Once the flex has become wet, it can hold water for years, making a ideal breeding ground for molds, mildews and fungus, and pose a risk to the occupants health. The second shot is a duct resting on the ground. All ducts must be at least 4" off the ground (more is better)*. Contact with the ground will cause heat loss, make it susceptible to water problems, and easy access for rodents. In the third picture, the duct is dangling. This type of flex ductwork should always be fully extended, and strapped up at 5' intervals minimum. The maximum amount of sag between supports is 1/2 inch per foot of horizontal run. * This duct is way too loose and will restrict airflow. This final picture shows a duct that is not connected at all and is blowing heat into the crawlspace. This makes it nice and warm, attracting rodents and giving them easy access to the interior of the home. These are all issues that most clients would have never known about had they not had a professional home inspection. You would think that the city inspectors would have noticed these kind of issues, but in my years as a contractor, I have never seen a municipal inspector even enter a crawlspace.